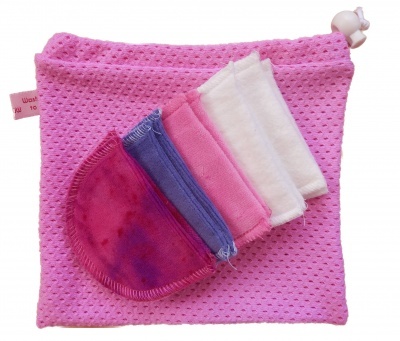 12 washable makeup remover wipes and organic cotton wash bag. Organic reusable makeup wipes and an organic cotton wash bag. This is the perfect kit for removing your make-up. 12 small washable wipes in all colours and shapes complete with an organic wash bag to keep them in order in your washing machine. All washable up to 60'. They are made out of scraps of organic cotton fabric and are therefore irregular shapes and sizes. You will get a mix of colours. Hand dyed item, please wash with like colours for the first few washes. Pre-wash before use.